"The story of the trials and triumphs of David Copperfield, growing to maturity in the affairs of the world and the affairs of the heart - his success as an artist arising out his sufferings and out of the lessons he derives from life." 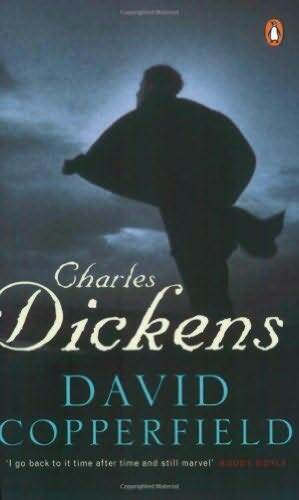 Dickens is perhaps most famous for penetrating the darkest side of human nature, and even though David Copperfield seems almost Proustian in scope thanks to its time span, Dickens still manages to do this in quite some detail thanks to well-drawn characters, tribulations of plot, and the struggles faced by London's nineteenth-century poor. The eponymous protagonist's burgeoning maturity, and yet omnipresent naïveté, throughout the narrative means that his growth from child to man seems to happen before our very eyes with realism and sincerity, despite there being little change in the formality of the language used. This flowery style and chronological order can make David Copperfield seem like a struggle initially, with the eccentricities of the characters not becoming endearing to us until later on, thanks to Dickens' enduring stratagem of repetition. As these characters fade into and out of the narrator's life at different stages, we know we're unlikely to hear the last of them, and we are right; rest assured that Dickens doesn't end this epic tome without tying up each of their stories neatly (maybe, some readers might say, a little too neatly). This technique also, however, has the merit of meaning that we have to read on to find out if our predictions regarding plot or personage will come true, and that we are eventually satisfied and rewarded for our perseverance. And there is plenty to pursue: Dickens does not only tackle the dark side of human nature through themes such as deformity, despair, and deceit, but also gives the reader plenty in the way of levity, thanks to his approaches to the pleasures of love, friendship, and simply getting blind drunk with your first pay cheque. We therefore easily recognise aspects of our own lives in elements of David's, thus reflecting one of the many reasons why Dickens' works are considered classics, thanks to their ability to plumb the depths of human experience. Dickens' powers of description also never cease to amaze, thanks to his superior lexicon and sheer technique. These gems are treasure that can be found in Dickens' pages by all those who care to hunt for them, and contribute significantly to making the act of reading his works a continual pleasure. While aspects of his literature may not appeal to all - such as the writer's well-documented interest in convoluted legal affairs - Dickens never ceases to keep us interested, thanks to characters that irritate, inspire, and intimidate; terrific showdowns; and a variety of well-depicted settings which can, to a degree, still be recognised today. The author described David Copperfield as the favourite of his own books, and it's easy to see why: while a little syrupy towards the end, it combines memorable characters with a dose of social reality, as well as situations and feelings that everyone can empathise with. By the end of the story, we feel as if we have grown along with David, and are sad to see him go; and yet we can also feel that he has grown into someone we can all be proud of and aspire to be, and so be confident that he will be fine on his own, even after we have closed the book. Making us believe that the characters created are so real to us - more than beautiful descriptions or a skilfully sculpted narrative - is perhaps the ultimate hallmark of a truly great writer, and it is this that maybe encourages people more than anything to continue seeking out Dickens' work. Ooh wow...an apology is clearly in order.